Castells are human towers that can have from four to ten stories of height. 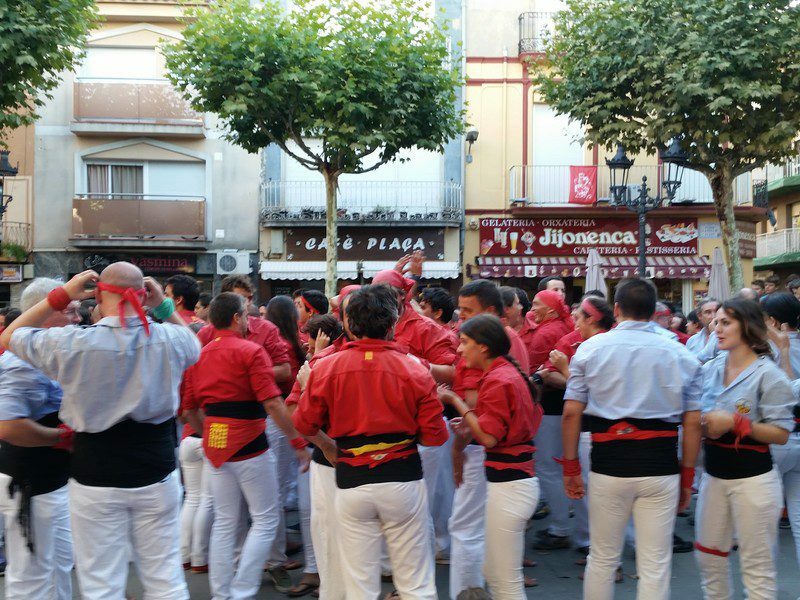 They are raised by groups of castellers called colles castelleres, traditionally in festivals at many places within Catalonia and other Catalan-speaking areas. 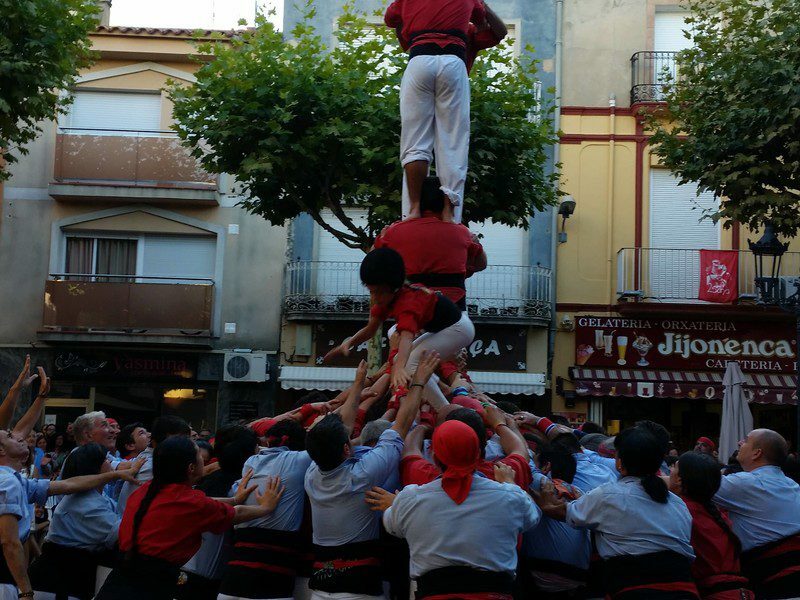 As for the composition, all castells have, from the bottom to the top, a pinya, the base that takes the weight of the tower structure and where, sometimes, the audience is invited to join; the tronc, the structure of castellers who climb up on top of each other and which can be from two to five stages high; and the pom de dalt, the top three stages consisting of the dosos, the aixecador and the enxaneta. Each tower rises to the sound of gralles and drums that play traditional melodies and contribute to the feeling of uncertainty, set the pace and enhance the excitement. During a performance, the participants can be distinguished by the colour of their shirts and wear a sash (‘faixa’), to support their lower back and help their teammates climb up the tower. 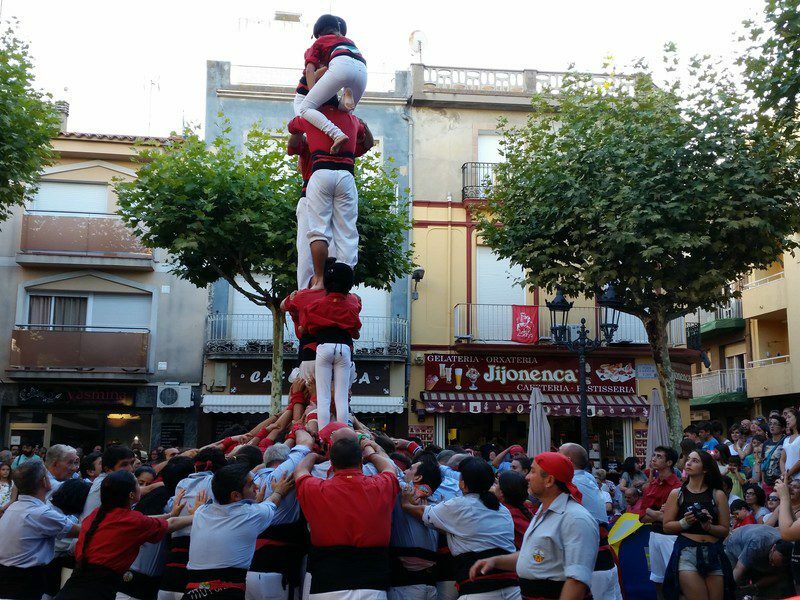 This truly genuine cultural display, which is nowadays very rooted in Catalan tradition, was born at the turn of the nineteenth century in Valls, evolving from a dance called Ball de Valencians, which ended with the building of a human tower. After a first Golden Age in the second half of the nineteenth century, castells underwent a period of decline and were about to disappear. Fortunately, in 1926 they started enjoying a revival due to the creation of new colles (‘teams’) outside Valls and to their expansion in Catalonia and other Catalan-speaking territories. Democracy and autonomous government strengthen them and lead to an explosion of popularity in the 90s, when they achieved high-level structures and reached the media. In 2010 they were included by UNESCO in the Representative List of the Intangible Cultural Heritage of Humanity. The bond between Malgrat de Mar and castells strengthened considerably in 2013 thanks to the foundation of the team Castellers de l’Alt Maresme, els Maduixots, which represents the six towns that make up the region (Calella, Pineda, Santa Susanna, Malgrat, Palafolls and Tordera). The colour of their shirt is strawberry red (‘maduixa’) and their motto, Maduixots, amunt! (‘Climb up, Maduixots!’).